OLPC Australia has launched an impressive new updated website at http://olpc.org.au, adding to its online presence on Facebook and Youtube. The new site has a great design, easy navigation and lots of information about OLPC AU's plans to deliver a laptop to every child in remote Australia within 5 years. 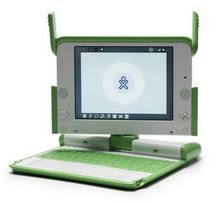 OLPC AU has already deployed 1,185 XO laptops to 18 remote community schools in the state of Queensland,Western Australia and the Northern Territory. The charity has attracted some great media coverage including this profile of OLPC Australia's executive director, Rangan Srikhanta, which appeared in The Weekend Australian. With the support of its founding partner, the Commonwealth Bank, OLPC AU is planning over the next 5 years to "deploy 400,000 laptops at a rate of 10,000 a month in some of the most remote corners of the country". "People might think it's a pipe dream, but it can be done," Srikhanta told The Australian. "Uruguay did it in less than three years. It's just (having the) will." The following clip is an interview with Natalie Crisp, a Senior Teacher from Shepherdson College, Galiwinku, NT, where OLPC Australia distributed the XO.